On the Home screen, tap the Videos icon. 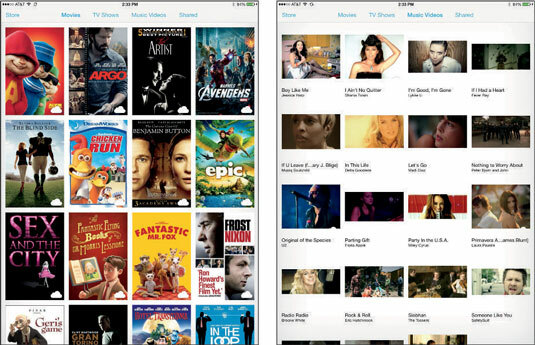 You see a tabbed interface for Movies, TV Shows and Music Videos, and (if you’ve rented a movie) a Rentals tab. If Home Sharing is active on your computer through iTunes, a Shared tab will also be visible. The steps for TV shows and music videos are similar. If you see the iCloud symbol on the video thumbnail, you can stream the movie, provided you have a decent Internet connection. Tap Settings–>Videos to choose whether to see thumbnails for all the videos you have stored in iCloud or on the device, or show only those that have been downloaded to your iPad mini. Tap the poster that represents the movie or other video you want to watch. Tap Details (if you’re not already in that view) to see the plot summary, run time, and more, well details about the movie in question. Tap Related to see posters representing other movies that are similar to this one, and that not so coincidentally are available to rent or buy in iTunes. 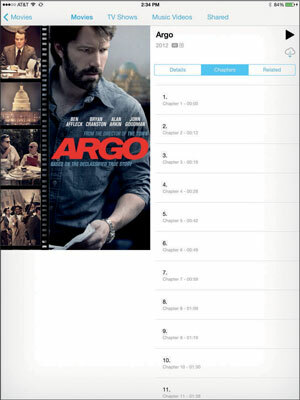 To start playing a movie (or resume playing from where you left off), tap the Play button. Tap Settings–>Videos to change the setting to start playing from where you left off rather than to start playing from the beginning, or vice versa. 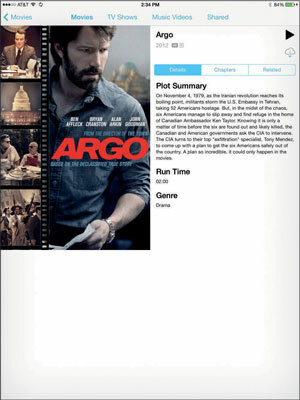 (Optional) Rotate your iPad mini to landscape mode to maximize a movie’s display. If you hold the iPad mini in portrait mode, you can see black bars on top of and below the screen where the movie is playing. Those bars remain when you rotate the device to its side, but the iPad mini plays the film in a wider-screen mode (depending on the video).